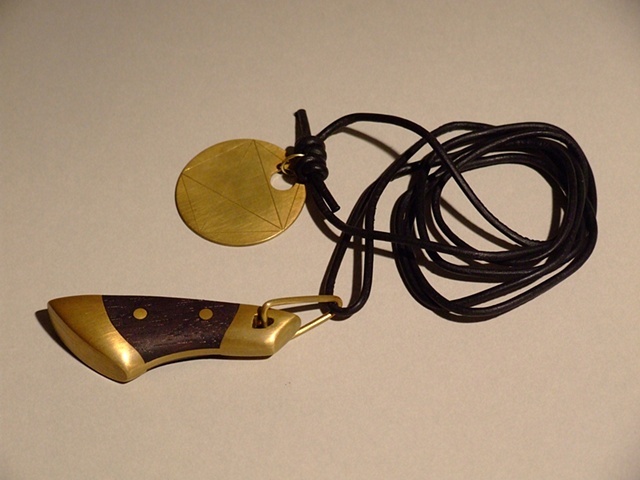 The amulet measures approximately 2.25” in length, and construction resembles the handle of a tool such as a hammer or a knife, with a central brass tang to which brass bolsters are attached. The scales of the “handle” are made from black wood and are riveted to the tang with brass rivets. The brass “medal” element is about 1” in diameter with a small round hole through which the leather cord is run. Incised on the medal is what is thought to be a geometric representation of the Golden Ratio, an ancient mathematical relationship found both in nature and in the designs of artists and architecture throughout human history.